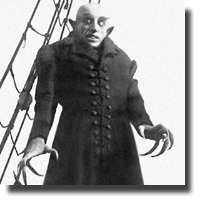 Almost 100 years after its first release, Murnau’s Nosferatu remains one of the most iconic and influential films in the horror film genre. This year the VSO brought the film to life, inviting guests to come in costume to a screening of the movie with live performance of the original score. Intrigued by this Symphony of Horror, reconstructed and conducted by Gillian Anderson, I made my way to the Orpheum through wind and rain to take my place in line. My initial reaction to the event was one of shock and delight. I hadn’t anticipated the level of effort that attendees would put in to their costumes, and was blown away by the variety of characters that were shuffling through the theatre doors. Hearing the warning chimes, I tore myself away from the crowd and hastened to my seat as the infamous adaptation of Dracula commenced. The tale is well known, tracing the experiences of a young lad and his wife as they struggle to escape the sinister clutches of a gruesome vampyre. What was particularly interesting was observing the crowd’s reactions to the overacting and simplified effects that are so common in silent movies. Despite the maniacal expressions of Knock and the fearsome figure of Count Orlock, an undercurrent of humour and delight defined the evening. Laughter broke out on more than one occasion during the course of the show, demonstrating how far horror has come since 1922. The orchestra guided the audience through the shifting tones of Nosferatu, complimenting the film so well that I had forgotten that they had been playing for an hour and a half with no intermission. As the credits rolled an enthusiastic applause rang out, celebrating the impressive performance of the VSO. As the lights came on and everyone filed in to the lobby there was an air of excitement, greatly heightened by the throng of costumed guests. Unlike most VSO performances, most of the attendees chose to linger in the stairwells and halls, chatting in groups and taking photos of one another. Looking around the room I could tell that this event could become a Halloween tradition for many. It combines wonderful music with cosplay and a cult classic, creating a vibrant cultural experience for those in attendance. After collecting my fair share of photos, including one of Nosferatu himself, I tore myself away from the merriment and ventured in to the rain once more.